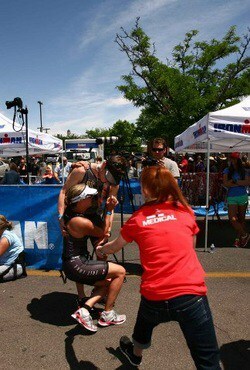 Congratulations to all of those who raced Ironman St. George last weekend. There were lots of friends and family at the event and it seems everyone had a good day. Cliff English: The best “poor man’s” recovery tools? Water, salt and an ice bath. Meredith Kessler: People tend to concentrate on days off, tapering and sleep. But you need to practice recovery after every workout … so you can be fresh for your next workout. I use a steady diet of protein drinks within the fueling window, as well as cooling wraps and recovery boots after workouts or at night. Andy Potts: As much as the experts tout sleep, I still think it is underrated. Sleep should be your No. 1 form of recovery. Ben Hoffman: There are no magic bullets for bouncing back fresh as a daisy, but if you do all the little things, they make a huge difference. I use compression boots with cooling pads, foam rollers, golf balls underfoot, The Stick roller, regular massage, eating a good balance of carbs and protein immediately following workouts and getting plenty of rest each night. Tim O’Donnell: Recovery is more important than fluff workouts. If it comes down to a 60-minute aerobic ride that is on your training schedule versus getting a massage when your body is beaten up, or getting an extra hour of sleep when you are exhausted, treat yourself! Terenzo Bozzone: The faster you recover from training, the more key workouts you’ll be able to do along the way. I use compression socks and sleeves after all workouts. When I get home, I elevate my legs and use compression boots.